If you are familiar with the Kreg line of woodworking tools you know they are engineered for precision performance and to make the lives of every day woodworkers easier and their work production, faster. Well the Kreg PRS1040 Precision Router Table System is no different and will not disappoint. Taking design cues from high-end table saw rip fences, the Kreg Precision Router Table System features a fully enclosed, t-square style fence for complete use of your miter slot and small adjustments on the fly. Its vibration and noise resistant MDF table has a high-pressure laminate Easy-Slide Micro-Dot skin, which makes it easy to slide workpieces across the surface. It also boasts a precise insert plate that mounts to any router without the usual extra holes you don’t need. Bottom-up levelers feature eight individual contact points for leveling accuracy, and dual reducing rings (2 inches; 1-13/16 inches) provide the convenience of Porter Cable guide bushing capability. For added flexibility, independent fence faces allow the table to double as a vertical jointer. Unique t-square style fence keeps the fence permanently parallel to the miter slot. Precise insert plate designed to mount to any router enables a perfect custom fit. A quality router table is one of the most important tools for any serious woodworker. Whether you’re routing a simple dado, putting the finishing touch on a countertop, or building an entire set of raised panel doors from scratch, the Kreg Precision Router Table’s innovative features will help you finish projects faster, easier, and with greater precision than ever before. The Precision Router Table fence has a t-square style design that keeps the fence permanently parallel to the miter slot. This automatic squaring lets you fully utilize your miter slot and makes it easier than ever to make small adjustments on the fly. The fence is made from an incredibly rigid fully-enclosed aluminum extrusion which supports even the largest workpieces, and creates a full length vacuum chamber for superior dust collection and a cleaner shop. The fence also includes two fully independent fence faces, allowing the router table to double as a vertical jointer. Vibration and noise resistant MDF table top and flexible steel stand. This router’s professionally edge-bended tabletop is made from vibration and noise resistant MDF with a high-pressure, impact-resistant laminate skin that makes it easy to slide workpieces across the surface. Two steel support struts prevent bending or bowing, and the combination miter/t-slot works with a variety of accessories for greater project flexibility. Made from an incredibly durable phenolic, this standard sized insert plate (9-1/4 x 11-3/4 x 3/8 inches) has been designed to mount to any router without the usual “swiss cheese” type surface found on most router table insert plates. Utilizing your router’s base plate and the easy to use template (included), mounting the insert plate to almost any router leaves you with a perfect custom fit completely free of extra holes. Dual reducing rings (2 inches; 1-13/64 inches) boast three independent leveling/lock-down screws and compatibility with standard Porter-Cable guide bushings for fast and easy template routing on your router table. For even greater precision, the lens cursor offers incredible accuracy without a tape measure and pencil. The Precision Router Table Top rests on the Kreg Universal Steel Stand, which is also the base of the popular Klamp Table. This rugged stand is adjustable from 31 to 36 inches in height, and is constructed from incredibly durable steel. 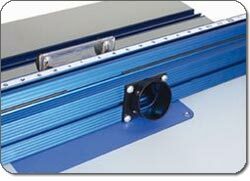 For additional mobility, Kreg 3-inch dual-locking casters can be added at any time. 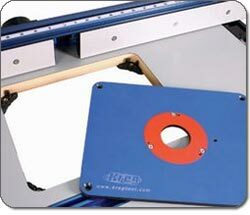 The Precision Router Table measures 41 x 32-1/4 x 24 inches (HxWxD) and weighs 85 pounds. Precision router table, fence, table legs, and instruction manual. 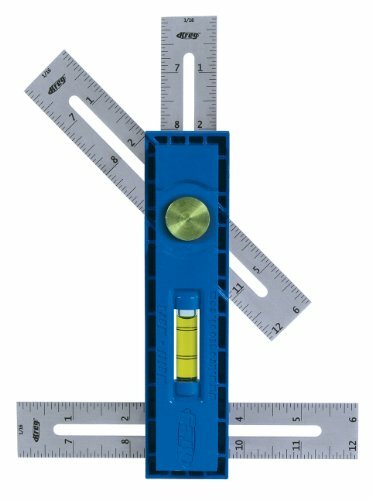 Get Kreg KMA2900 Multi-Mark Multi-Purpose Marking and Measuring Tool at the best price available today.